Durga, seated Durga, Durga statues, Durga bronzes, goddess durga, hindu statues. Durga is one of the most important and powerful goddesses of the Hindu pantheon. Originally worshipped as the embodiment of natural forces which grant life as the same time as taking it away, she was later asigned the role of the shakti of the impersonal absolute, the female conterpart of the great male deity. In this role she was also seen as the wife of Shiva in addition to, or as part of Parvati. In her friendly manifestation she feeds people and animals, but above all, she is the warlike protectress who always reveals her destructive strenght when the earth is threatened by demons. 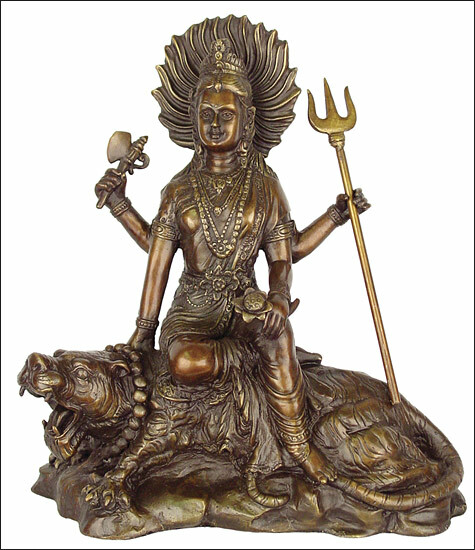 she is known for her victory over the buffalo demon Mahishhashura, which none of the male gods could defeat. Durga is worshipped as the Protectress of the Law, Destroyer of Evil and Preserver of Dharma (the doctrine of divine law). Durga usually has four to eight arms, and sometimes three eyes. She often sits on a a lotus throne, or rides a tiger. Her attributes are a trident, sword, snake, bell, drum, skull bowl, bow and arrow, wheel, club, water jug and conch shell.